Hope everyone is enjoying a nice long Holiday Weekend! As for myself I have been enjoying soaking in some rays, and hiking through Labor Day!!! 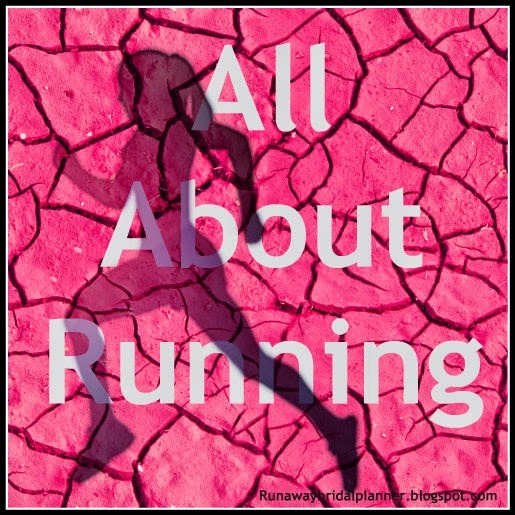 It's been exactly 20 months and a couple of weeks since I actually wrote a single post dedicated to only my running. I figured today is as good as day as any to break that streak!!! If you've been following my getting back into running after the long work injury layoff you probably have noticed that it took me a while to re train the muscles in my ankles and tendon area to take the running again. About 6 months ago I couldn't even run 10 feet. 4 months ago I was still working on running in 100 meter increments. 3 months ago I finally built the weakened muscles up enough to run 1 mile. Then I had to take a little time to let that settle in and get used to it before I could move on. Once I got to that point I have been (as the body allows) trying to slowly increase my weekly runs by 1 mile a week. What I mean is, I don't count the miles walked as part of my goal on getting my body retrained. Yes the miles walked help me burn more calories and that is why I do them, but they aren't really going to help me much in the terms of eventually getting back into marathon shape. So the miles ran, I only count the non-stop miles, the ones that I didn't have to stop and take walking breaks between. I was thrilled to pull off a 4 miler this week!!! I have to say, getting back into running shape, and increasing the miles is harder than I ever remember it before! I think that is because before I was always in pretty good shape to begin with. But taking a body that was forced to be inactive for about a year and work in increasing miles again. Oh boy, it's giving me a good reminder and respect for the sport that I love! I'm also really enjoying starting to feel stronger again. Where I live, I don't really have the choice to run on a flat surface unless I hit up the local track. Because I wanted to take it easier on my body the past months I had been taking trails/roads that run an east/west from my home because those are more gradual hills. However, one because I am getting bored of going those routs and two because I actually love hills, I decided this past week to see how my tendons will handle running hills again. So I went the north/south routes a couple of times this past week with no tendon pains. Which helped me discover a couple of things. Two, I am really out of shape for running up steeper hills, I am a little on the wimpy side right now! It will all come in time, but I seriously have no complaints I am enjoying the journey and taking every precaution to listen to my body, listen to when I should back off, and when I can push more. I think ultimately this is all going to make me such a smarter runner for the future! 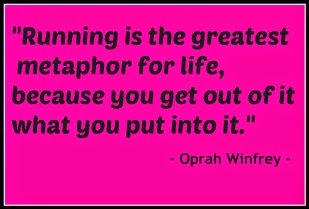 So this week I look forward to breaking a non-stop 5 mile run with good hills. One of my first mind goals is getting to the 6 mile point, which if all goes good should be in 2 weeks. Why is the 6 mile run one of my first goals? For some reason in 2001when I started training for my first marathon I remember hitting the 6 mile point as my first goal, and then the 10 mile point as my 2nd goal, 16 for the third goal and the 18 or 20 miler for the final training goal. Because I started that way, those numbers have stuck with me. So once I can get to that 6 mile point, I will know I am 1/4 of the way on my goal to being back into marathon shape:) Or so my mind will tell me! 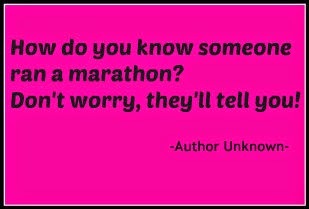 When will be my next Marathon? It's WAY too soon to tell, and I have a LONG way to go before I start actually registering for a race. However, WHEN I pick it, it's going to be an AWESOME race for a couple of reasons. It will not only be my debut post-bad--work-injury marathon, but it will also be my 33rd state, and my 40th overall. And #40 is a big mile marker for marathons under someones belt, at least to me it will be! Awe to dream (and I do almost daily now)! I'd be lying if I told you that I haven't done the math and planned the training out in my head and picked a few possible month/date/race to shoot for... I mean that is only human especially from this girl:) ha ha. So tell me, what are your running goals for this week? Do you enjoy running hills too? If you were ever laid off for some reason or another how did it feel as you inched closer to your comeback and goals?